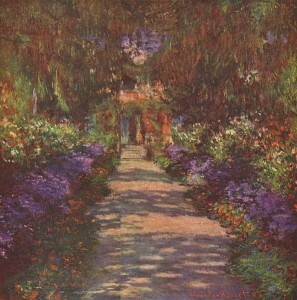 Countryside and urban landscape are full of inspiration for the artist. Here in the UK, days are lengthening and weather is (sometimes) dry, so this is a great time to consider heading outdoors to draw. A lightweight folding stool or chair so that you won’t be restricted to drawing from park benches, etc. if you prefer to draw while seated. Rucksack to carry your stuff- you may choose to walk quite a distance between stopping to draw. A portable easel is optional, but is particularly useful if drawing on a larger scale. A few sticks of charcoal and chalk and a putty rubber (this works well with toned paper). Charcoal smudges, so bring greaseproof/parchment paper with which to protect your work on the way home if required. Also do remember wipes for clean-up. A pot of ink (brown is lovely) plus water for clean-up, and a dip pen plus one or more nibs. For ink and wash techniques, also bring a brush and one or more little containers in which you can dilute the ink. Pencils (coloured or otherwise) plus a good sharpener and a bag or container for any pencil-sharpenings. Medium: Pen and ink on cartridge-type paper. A ballpoint, cartridge or marker pen are fine. For more characterful lines, try a nibbed dip pen or reed pen plus a bottle of ink. You’ll also need an HB or 2B pencil for a little light under-drawing. Subject: Any landscape or cityscape in which your view is not obstructed by nearby trees or buildings. Looking at the subject: Can you see the foreground, middle distance and far distance? Remember that, whether you choose to sit or stand while drawing, the horizon-line will be at you eye level. Can you see any part of the horizon, or do buildings or trees entirely obscure it? Is the ground flat, or does it slope one way or the other? Decide how much of the view you’d like to include in your drawing. The drawing: In this drawing, you’ll aim to convey a general sense of the “lie of the land” (US: “lay of the land”), i.e. its hilliness or flatness, and a sense of distance. Textures of surfaces can also be suggested. Start with a few light pencil marks on your page to show where the important bits of the landscape are to be positioned in your drawing. These pencil marks can be erased or forgotten once you have drawn in pen over the top of them. I suggest marking a faint horizontal line across the page to show the level of the horizon. Also use your pencil to indicate where any buildings, hedges, paths are to go. Try to indicate with your pencil the position of slopes in the ground, if any are present. Now tackle the drawing with pen. 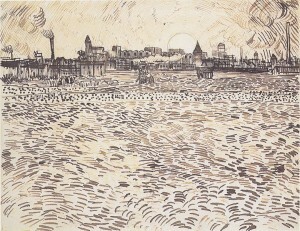 I suggest an approach similar to that used by Vincent van Gogh in many of his drawings. 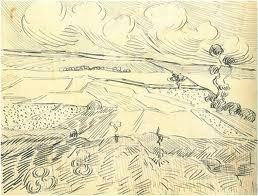 Work across the landscape, using whichever pen marks you choose (dots, sweeping strokes, etc.) to suggest the slope or direction of the land and the texture of the surface. Keep your pen marks lively. 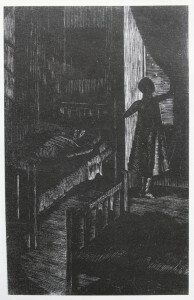 We are not trying to convey the effects of light here, so laborious cross-hatching or shading are not required. Pen marks should tend to get smaller as they disappear into the distance in your picture. They may also converge into the distance, e.g. 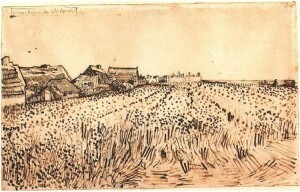 if suggesting rows of corn or edges of a path leading into the picture. This helps to give your picture a sense of distance. Taking this idea further: You may wish to develop this idea by drawing in colour. Feel free to use the same linear style as described above, this time working in coloured inks, coloured pens or pencils. If you wish, you may choose colours to help emphasise a sense of distance (cool colours tend to recede, while warm ones come forward). Your colours may be based on those of the landscape itself, or you may opt for a more experimental approach, with colour providing a sense of emotion. 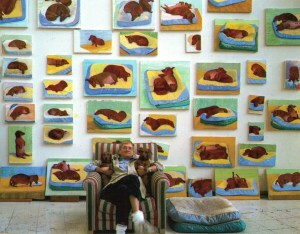 Like David Hockney (see image above), you could add in blocks of painted colour if you wish. 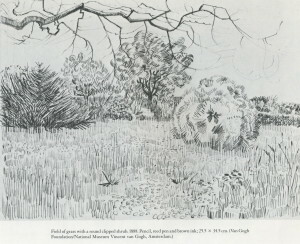 Several of Hockney’s landscape sketches have a similar “lie of the land” approach to those of van Gogh, with an emphasis on distance and topographical features of the landscape, plus touches of surface texture. When the evening light is fading, have a go at drawing the silhouetted shapes formed by trees. These could be very quick, fleeting sketches suggesting the general shape of the tree masses. Charcoal, graphite or brush with ink are all ideal for sketching simple trees, or you could block them in using pen or soft pencil. Try doing several little sketches of different trees (or groups of trees) across a double-page spread of your sketchbook before the sun completely disappears. Trees do of course form tonal shapes at any time of the day. Look at them with screwed-up eyes to emphasise this effect. 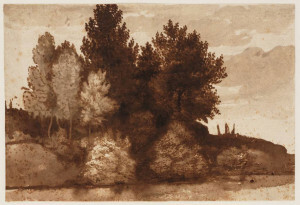 For a more finished drawing, as in Lorrain’s image of trees, above, look out for any more subtle variations in tone. As a whole, the trees and the ground that they stand on may be much darker than the sky behind. However, a closer look reveals some parts to be a deep, almost black shadow, while other parts are lighter in tone. 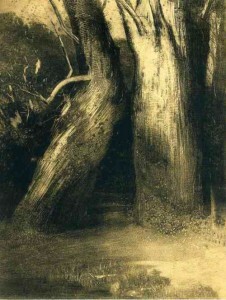 Tone can have quite an emotional impact (for example, see the image by Redon, above). When you are exploring woodland, other countryside or urban areas, keep an eye out for those unexpected dark shadows or startling contrasts that make you look twice. Each tree has its own unique structure depending not only on its species but also on its history, the prevailing wind and so on. They are just as worthwhile to draw as a human or animal figure though, of course, they will neither walk away nor charge you by the hour. Check, for example, whether it is taller than it is wide. At which point off the trunk do the lowest branches emerge – a half, a third or a quarter of the way up? Do the branches reach up almost vertically to the sky, do they stretch out horizontally, or do they branch off from the trunk at an angle? The general structure of the tree should be drawn out before considering adding small details. If attempting to draw the entire tree, do step back far enough so that you can see the entire structure without moving your head, even if this means working from the opposite end of the field. 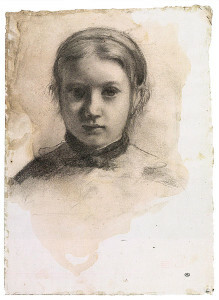 1) In graphite, pencil or pen. 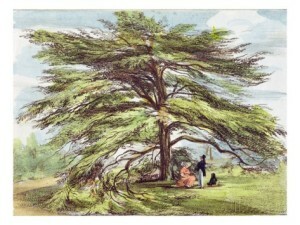 Using the whole double-page spread of your sketchbook, sketch the tree very rapidly using a continuous-line technique, i.e. do not lift your drawing tool off the paper form start to finish. You should end up with a flowing image with an intuitive quality. 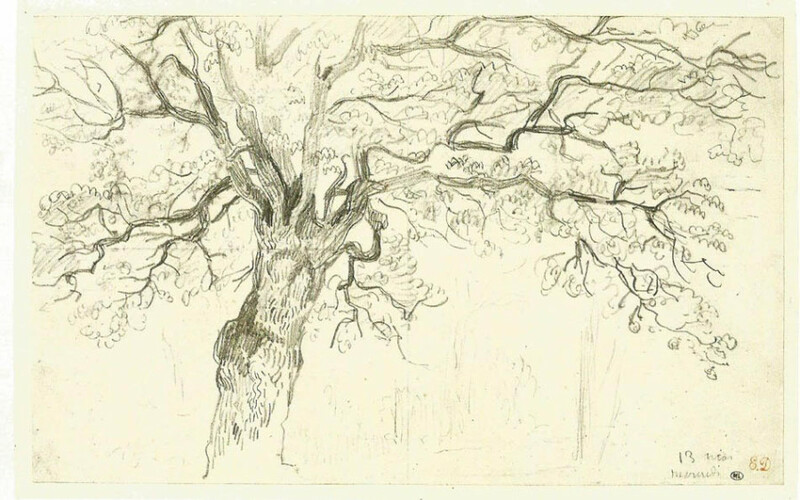 2) In pencil, charcoal or graphite, use a more careful, structural approach to drawing a tree. Work much more slowly (e.g. over a period of 40-60 minutes). Make multiple measurements using your outstretched arm to check the proportions of trunk, main branches and masses of foliage, and estimate angles of the main branches. Use the tip of your charcoal or graphite stick to draw edges in once you have worked out where they should go. 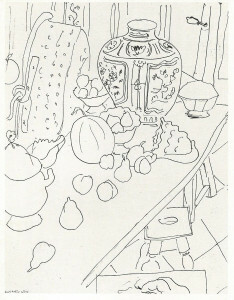 As you build this drawing up, turn the charcoal or graphite on its side to block in regions of dark tone if you wish. 3) In any medium of your choice, draw from the tree using a mixture of careful measuring marks and more intuitive, flowing lines. A tree that is growing at an unusual angle is a good one to draw to start with. Leave about 30 minutes for this drawing as it is better left uncompleted than overworked. I suggest starting by making a few measurements and checking how your tree will fit onto your paper. Work into the drawing more boldly to emphasise the direction of the trunk and branches and perhaps to suggest movement if it is a windy day. Just draw! Part 1: Getting back into drawing. 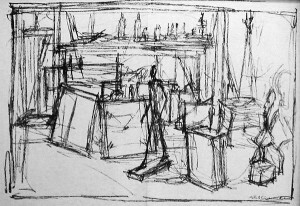 1) Having broken the “habit” of drawing, you start to lose confidence in your ability or in your materials. 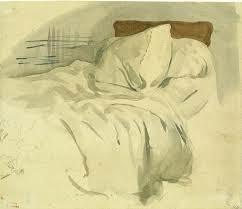 2) You not only stop drawing, but you stop “looking”, i.e. observing and thinking. In such cases, the thought of starting to draw again may seem pointless or perhaps even fill the artist with dread. As the ability to create art is tightly-bound to an artist’s sense of self, there tends to be a basic emotional need to continue. Worries about getting back into drawing (or other art-making) typically leave the artist feeling conflicted. So…how can one best “get back into drawing”? In this and the next few articles, I’ll offer some practical suggestions for returning to art-making and some relevant drawing exercises. This is a universal issue for artists, so do feel welcome to post comments at the end of the article if you have further suggestions to offer. Set aside a regular short time in which you’ll get on with drawing (or using any other chosen medium) in a business-like way. A session as short as 15 minutes per day will suffice if you are busy. A regular half-hour slot may feel more satisfying. Feel free to set a timer to separate your “drawing time” from the rest of the day. During your chosen “drawing time”, be very clear with yourself about avoiding distractions such as internet, mindless housework, phone, etc. Keep your chosen art materials ready for the next use. Pencil(s) should be left sharp, paper ready-clipped to a board or in a sketchbook. If using paints then aim to leave all equipment clean and ready for the next session. If you have space then do not replace paints and brushes in a drawer, but leave them ready to pick up and use again. If using an easel then leave it set up and ready to go. It doesn’t matter how boring your surroundings initially appear to be. Click here for an article on looking and seeing. Play around with observing your surroundings in an abstract way, and combine this with taking a few photos if you wish. In the words of Bayles & Orland in their highly recommended book, “Art and Fear”, start to “notice the things you notice”. Pay attention to your personal reactions (both to objects and ideas) as these are key to the art that you will go on and make. Above: Starting to look at the world in an abstract way. Drawing on paper (as opposed to painting, printing, sculpture, etc.) is well-suited to the returning artist who requires a versatile, experimental approach. Pen, pencil or crayons are useful allies: portable, non-messy and adaptable, they are always ready to be picked up and used. As ever, it is useful to turn to the great artists for inspiration. However, I never aim for a “perfect piece of work” comparable with a known masterpiece. Not only would such an approach inevitably lead to frustration but, in my opinion, a goal of complete perfection has little to do with the artistic thought process. On the other hand, borrowing certain ideas, practical methods and “ways of seeing” from other artists can be extremely useful in getting us back on track. 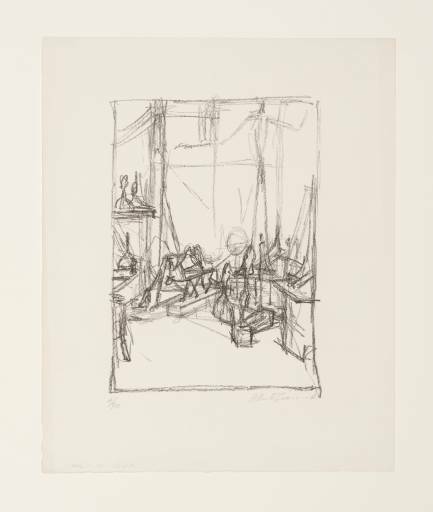 Above: A studio drawing by Alberto Giacometti. 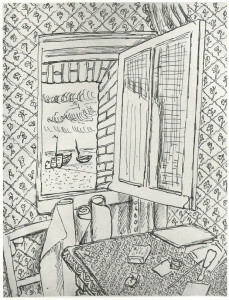 Without being in any way overwhelmed by Giacometti’s achievement, we can use this drawing to get us looking at scale, at spatial relationships between objects, and busy versus quiet areas within a composition. During the past few years, I’ve written down outlines for numerous drawing suggestions for my own use, each inspired by a famous artist’s sketch or drawing. Each drawing idea includes a suggestion for subject, medium and approach. Over and again, these lists of ideas have proved invaluable in getting me drawing again when I feel “stuck”, and are always a good starting-point for completely new artistic approaches. Poor weather or a lack of inspiring subject need not stop us from drawing. In my next article, I shall share a range of drawing suggestions that can be started and completed indoors, within any home or studio. Above: “Eli and David”, by Lucian Freud, 2005-6. 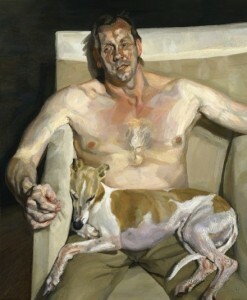 A portrait of David Dawson (Freud’s assistant and friend) with his whippet. 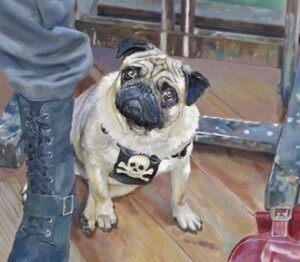 I find “Eli and David” remarkable both as a powerful composition and for the way in which it demonstrates a key aspect of human-canine relationships. This man, painted with all his human flaws and concerns, comes under our close scrutiny, but the dog accepts and trusts him regardless. As in several of Freud’s canvases, the dog does not care about the figure’s semi-nakedness or awkward pose. Squashed together within the armchair, dog and owner appear to accept one another’s close presence without criticism or complaint. 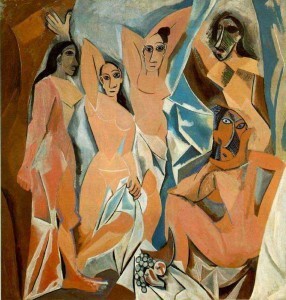 Compositionally, this painting has a wonderful abstract quality. 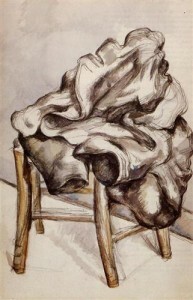 It is broken into major sections by the horizontal edges of chair back and dog’s back, with the black background forming a strong inverted “L” shape. 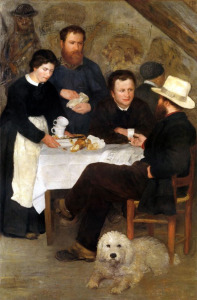 The side of the chair forms a vertical barrier against which the dog’s head is squashed, adding a feel of dynamic tension to the whole image. Negative shapes between dog, chair and man echo one another pleasingly. 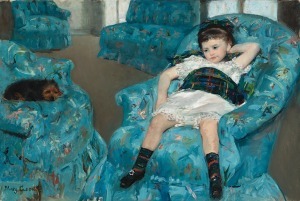 Similarly, the girl sprawled in the chair in Cassatt’s image appears uninhibited in the presence of her canine companion. Both girl and dog are dwarfed in this room of outsize armchairs and this image could represent the strange childhood sensation of feeling out of place. 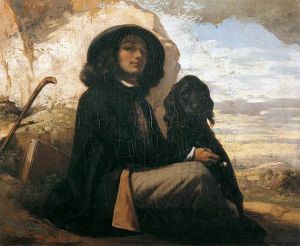 Apparently unaware of the painter, the girl looks to the dog for companionship though, in this case, there is a quite a void of grey carpet between them. Painted as a rounded, enclosed, intensely dark oval, this terrier forms a strong enough shape to counterbalance the image. In contrast, the final image in this series is otherworldly. The fallen female figure is the nymph, Procris, who in Greek mythology was accidentally shot and killed by her husband, Cephalus. The presence of both satyr and dog is mysterious. 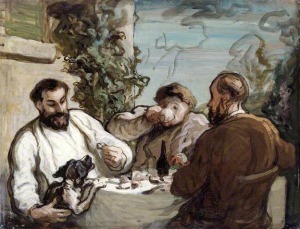 A satyr was not present in the original story, and the identity of the dog is unclear. Between them both, the satyr and foreground dog create a compositional arch above the dead nymph. Look at the curves of their backs clear against the sky. Though the husband (the only human in the story) seems to have disappeared, this arch suggests care, protection and fidelity. The satyr shows compassion and tenderness, but the dog gazes unflinchingly at the strange scene. 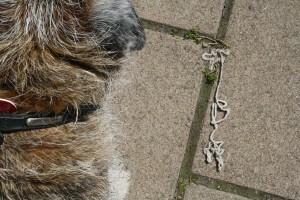 As probably occurs over and again in real life, this dog has been a silent witness to some strange human drama. 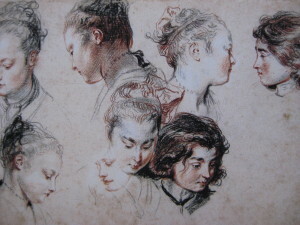 Shapes are essential to the character of each artistic image. Have you ever glimpsed a painting from a great distance, and understood something of the emotion conveyed by the artist even before discerning the full content of the picture? Along with tone and colour contrast, clear shapes within the image can help to convey this “emotional punch”. Our innate emotional “understanding” of 2D shapes is perhaps even more profound than symbolic meanings assigned to them in different cultures. I originally read about this idea in “The art of responsive drawing”, an excellent guide to drawing and composition by Nathan Goldstein, and do recommend getting hold of this book if you’d like further ideas on the subject. 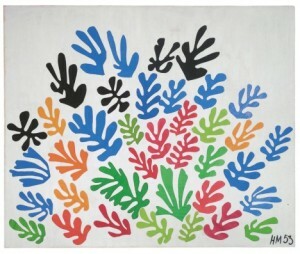 Let’s look further at how artists have used various types of shape for emotional effect. The bodies and drapery of the two main figures in Botticelli’s “Venus and Mars “provide good examples of long, flowing shapes. Even the male figure of Mars, god of war, is made to look lyrical and sensuous here. Note how rotation through his torso and neck allows the creation of asymmetry and curves. Meanwhile, clever draping of fabric creates similar shapes associated with the figure of Venus, goddess of love. Look not only at the whole reclining form of Venus, but also at the sections of fabric about her waist and limbs. The atmosphere in the foreground here is of flowing sensuality, though the long, lyrical shapes do not extend to the four cheeky, mischievous little satyrs in this picture. …but look at the examples in the box, above, and note that rules are sometimes broken! 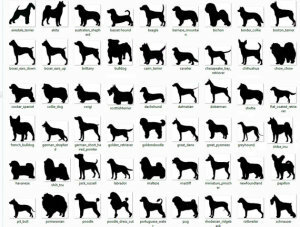 These shapes may also suggest strength and reliability. 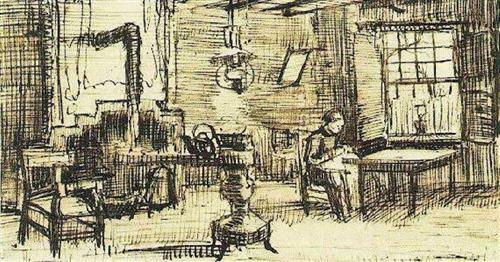 Hélène Rouart looks somewhat out of place in her father’s study in the image above. 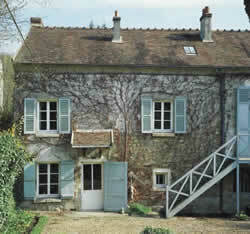 The strength of character of the study’s owner, wealthy collector Henri Rouart, is suggested by the shapes of his belongings. 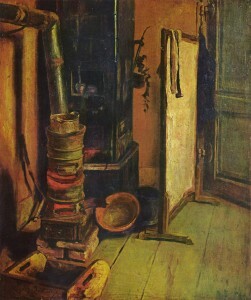 Look at the square-edged mirror, the painting on the wall, piles of papers and perhaps even the Egyptian mummy case. 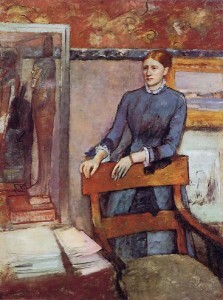 Set at an angle against the blocky structure of her father’s chair, the more lyrical forms of Hélène’s hands and figure contrast with the rest of the room. The young lady projects a sense of unease and seems constrained by the presence of her father even though he was abroad when this was painted. 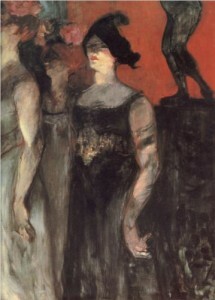 In Picasso’s rather shocking image, above, the women appear confrontational and perhaps even menacing. Cubist rendering of the forms here creates jagged, irregular shapes that contribute to the potentially-violent atmosphere. Jagged-edged, irregular shapes are frequently-seen in real life and in photographic snapshots: Think of gaps between tree branches, shadows and building edges seen at an angle. In creating an artwork, decide whether you wish to include, emphasise or suppress such shapes. 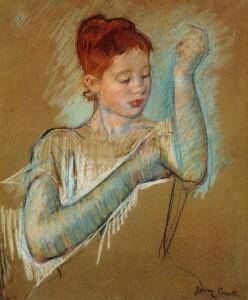 Gently rounded shapes are easily formed by the play of light and shadow on young faces (see Degas’ portrait of a child, above) and, whatever the subject, they can suggest tenderness and empathy. Of course, not all shapes quite fit into these simple categories. Take a look, for example, at Leonardo da Vinci’s “Lady with an Ermine” (reproduced at the top of this page), an image with an atmosphere of lyrical grace and poise and full of strongly-emphasised shapes. 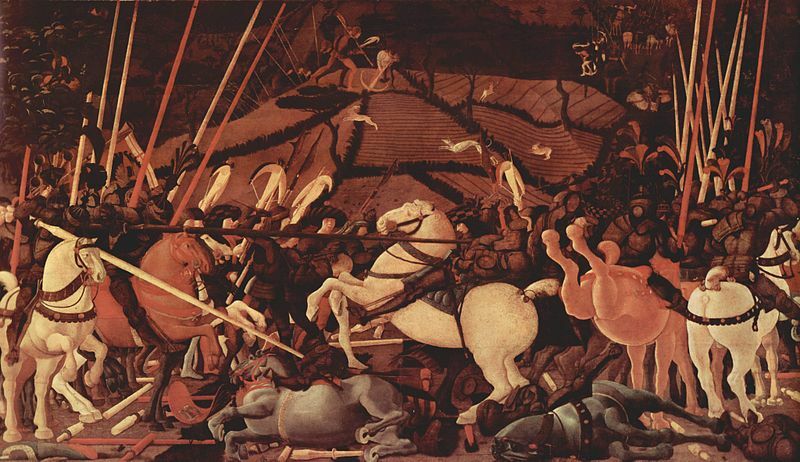 Or consider the carefully-placed structures in Uccello’s beautiful but horrifying image of war, below. This painting is full of curved-edged horses but, where lances cross the picture at an angle, numerous unsettling, angular shapes are created. 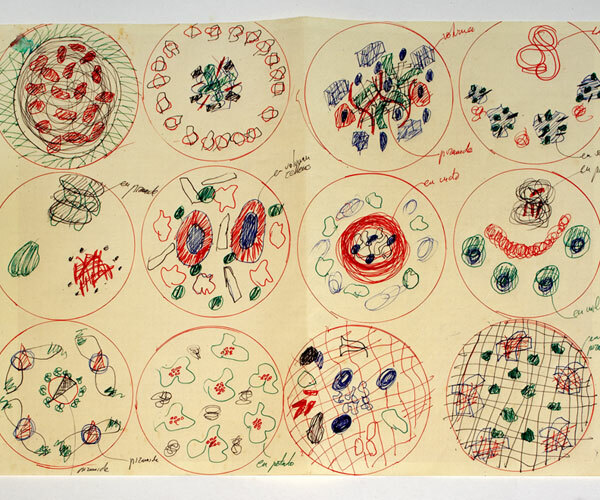 What can scientists learn from artists? In comparing approaches to art and science, I notice that certain shared skills tend to be better taught to artists while others are addressed more clearly in science lessons. Let’s look, today, at aspects of the artistic approach that some scientists may find helpful. My intention here is not to be unfairly critical, but to trigger positive discussion. If you are an artist, then do read on because these ideas may set you thinking. If you are a scientist, then you may or may not find this list helpful. Perhaps you are already using these techniques, see no practical place for them, or disagree with some of my assumptions? On the other hand, if you feel lacking in direction or otherwise “stuck”, then this article could perhaps be useful to you. Please read on and feel free to add your own thoughts in the comments box at the end. The ability to observe and consider everything around you…looking, listening (and smelling, tasting, or whatever is appropriate), is key to scientific enquiry. While techniques of methodical observation are taught in science classes, a delight in a general awareness of our surroundings is , in my experience, encouraged more in art than science departments. anything can be included, whether words, numbers or simple sketches (even if you feel that you “can’t draw”, it is fine to record visual or conceptual ideas using directional lines and simple shapes). 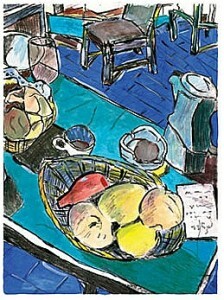 many of the ideas will probably come to nothing, while the occasional page may contain seeds of a new line of enquiry. Keep old completed books even if they seem to be full of hopeless scribble as, in years to come, you may look back through them with greater insight. 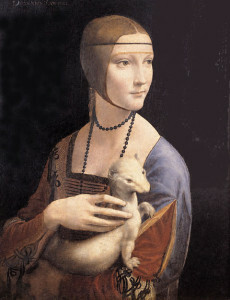 Above: Leonardo da Vinci. Notebook studies of both a seated figure and of turbulent flow. 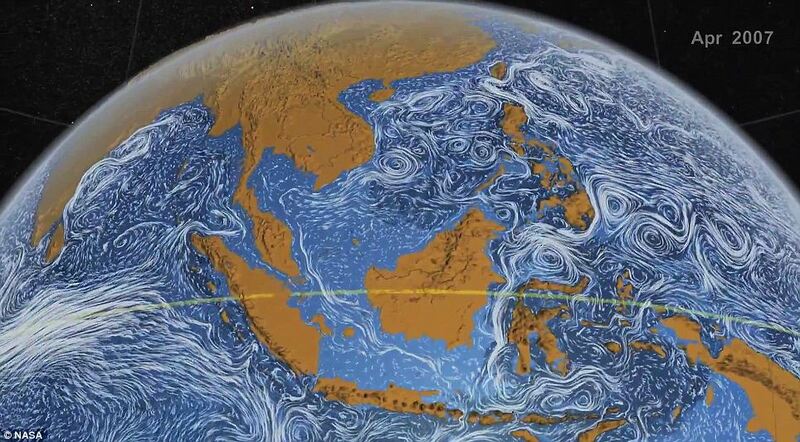 Note the association of flowing robes and turbulence images. The continuous format of a notebook or sketchbook encourages a sequence of interesting ideas. It is of course also possible to create an imaginative ideas book without being a master draughtsman. Young artists are encouraged to seek something interesting from the most mundane situations. 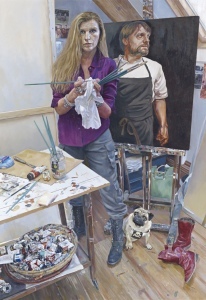 They might be expected to look afresh at a single piece of drapery, the surface of a puddle or the corner of a room and then create an original image. Should scientists take, at times, a similar approach? “I don’t know anything, but I do know that everything is interesting if you go into it deeply enough”. Good art teachers remind students to be aware of their own emotional response to each object or situation. On the other hand, scientists are expected to be highly-objective in recording what they see and emotional involvement is therefore often discouraged. Of course, objectivity is essential at certain times, e.g. when recording sets of values. However, there are occasions when an emotional response can help to direct you to initial observations that are surprising, and hence to those that may warrant further investigation. Don’t worry…I did also remember to record the objective data as originally planned. When making sets of observations, scientists need to work systematically and objectively and record measurements in standard units. However, additional subjective observation can provide a wealth of extra information, and having a meaningful descriptive vocabulary at your fingertips can be useful. For example, you may observe something as “lurching”, “bulging”, “swinging” or “sagging”, or hear it go “crunch”, “slosh” or “pop”. These are all unscientific words, but each may have a specific meaning to you. Use of such words can help both in understanding what is happening in a general sense, communicating with others (especially lay-people) and in directing future objective analysis. 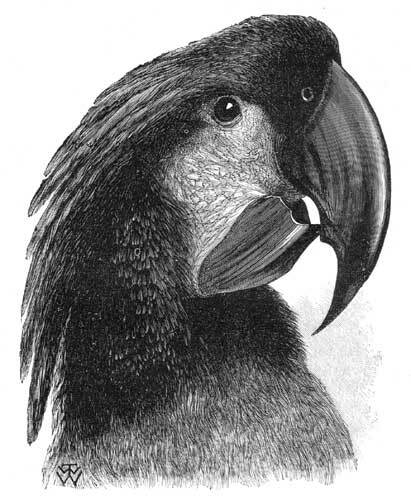 The cockatoo’s remarkably strong head and beak and surprising plumage turn out to be specific evolutionary adaptations. 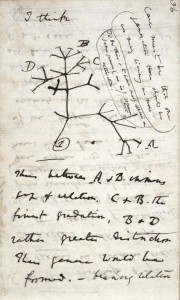 Wallace’s subjective approach was key to his understanding of relationships between species and their environment. Of course, he recorded numerous measurements and other objective data along the way. 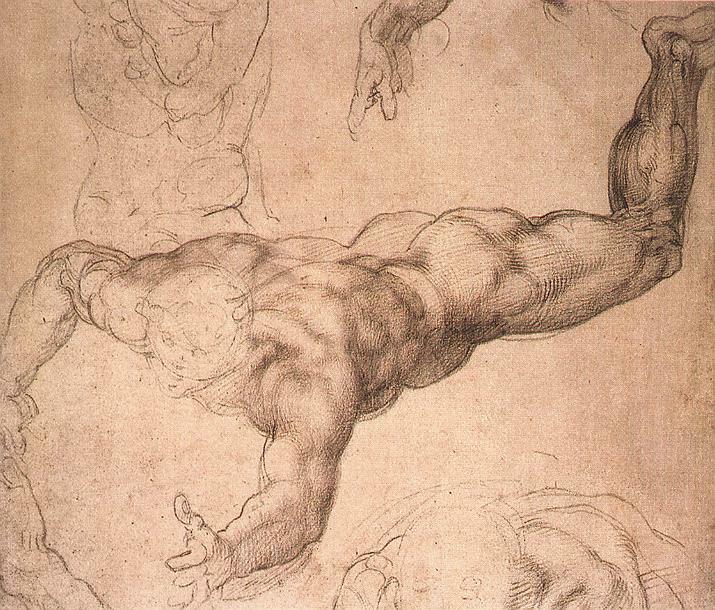 Above: A sketch for the Sistine Chapel by Michelangelo. This image includes clear rendering of muscles of the limbs and trunk. 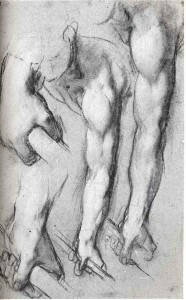 However, this drawing is primarily about the process of “reaching out forward”, and its gestural quality tells us more about the body than we can glean from dry anatomy texts. Some phenomena are so strange or unexpected that it is difficult to understand their implications without relating them to what we already know well. Analogies are used by good science teachers (click here for an online resource on teaching with analogies). A beautiful example enables us to “get our heads around” the massive scale of our solar system. Astronomical figures initially seem meaningless, but a model using familiar objects helps us to understand and engage with the huge distances. In the Thousand-Yard Model, familiar objects represent each planet, so the Earth is a peppercorn, Jupiter a chestnut, etc. The Sun is a bowling ball. These objects are taken outside and placed at specific distances from one another to represent their relative spacing in the solar system. The resulting model solar system is a thousand yards across and is quite awe-inspiring. Full instructions on pacing out the Thousand Yard Model are provided by Guy Ottewell and can be accessed by clicking here. But are there other areas of science where analogies are under-used? Imaginative comparison is key to the visual arts and of course to poetry. 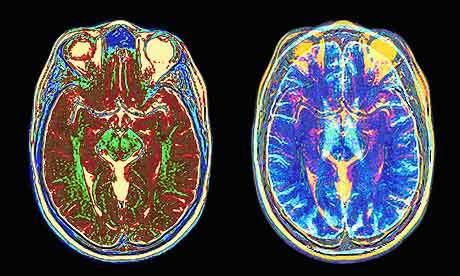 But does an emphasis on objective reasoning leave some scientists without these useful tools? 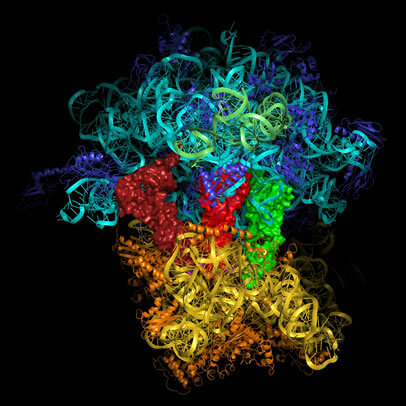 Above: The structure of a ribosome, an essential component of all living cells. While artists are often encouraged to follow their interests and passions, young scientists perhaps more easily find themselves following lines of enquiry dictated by perceived need, available funding or, at a school level, by a specific syllabus. Is this a cause for concern?